Because for some reason- they don’t let you play with the stuff in the galleries of Laguna Beach! 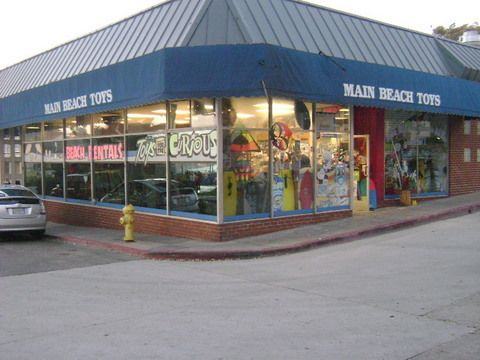 If you’re looking for a toy store in Laguna Beach, Main Beach Toys is the place to go!! They’ve got everything! Kites, balls, frisbees, Legos, games, trucks, Hello Kitty, removable tattoos, puzzles, coloring books, bubble-wands, activity books- just to name a few. Since I’m really just a kid at heart- I usually have fun just walking into this store and playing with all of the random stuff on the shelves! They always have new merchandise, so every time you go in- you’ll find new toys to stimulate the youngster in you! Seriously- they don’t really let you play with the stuff in the galleries, so this store is a great release for all of that pent-up energy! You’re definitely going to find some fun stuff! Directly adjacent to the grassy area and playground of Main Beach!